1. Starting September 17, 2018, the form will be seven pages instead of two. You must pay careful attention to each question and answer them all as accurately as possible. 2. In section 30. (c)(8) the form will ask you if you have ever been arrested in your home country, the United States, or elsewhere. Arrests include political arrests. It is extremely important to not omit this type of information as part of your application because the United States government may use it as a reason to deny your employment authorization and asylum applications. The United States government is more strict regarding asylum seekers than it has been in the recent past. If you have questions as you complete your initial or renewal employment authorization application, including about the required documentation, please contact RIF at info@rifnyc.org to schedule a legal consultation. More detailed information about the changes can be found on Angela Torregoza’s blog here. Victims of Domestic Violence Can No Longer Seek Refuge in the U.S.
We are saddened and outraged by the latest move by Attorney General Jeff Sessions to stop granting asylum to victims of domestic abuse. The Trump administration is systematically dismantling the U.S. asylum system and attacking the most vulnerable among us. This administration's flagrant disregard for abused women — at the height of the #MeToo movement — will only empower violent, abusive men around the world. We will never stop fighting for women who flee their home country to protect themselves and their children from abuse. Sessions, along with White House adviser Stephen Miller, are methodically chipping away at the various paths to access protection in our country: children are being separated from their asylum-seeking parents; for those who have been granted asylum, family reunification appears to be frozen; new asylum interview policies are punishing those who have been waiting for years; and now victims of domestic violence will be denied asylum. What is next? Will LGBTQ victims no longer be able to apply for asylum because they will be considered “victims of private violence” and, in the words of Jeff Sessions, “the asylum statute does not provide redress for all misfortune”? As an entry point for asylum seekers who arrive in the city, RIF will continue to offer fast legal advice and orientation for asylum seekers. More than ever, the right initial guidance is key to securing refuge. In the meantime, we pray that at least the Dreamers will get a path to citizenship. If you want to learn more please explore our website or contact Maria Blacque-Belair, RIF Executive Director, at maria@rifnyc.org. The RIF Team remains steadfast in its solidarity with all those working tirelessly on the ground and as advocates for refugees and immigrants. Thank you all for your caring support. Every day, the Trump administration wages war on immigrants. Most notably, the administration has ordered the travel ban, reduced refugee admissions, terminated DACA, ended Temporary Protected Status programs, directed ICE agents to arrest immigrants in courthouses, and targeted immigrant community leaders for deportation. A few days ago, the Department of Homeland Security quietly - and without warning - reversed the order in which it schedules asylum interviews. This may seem like a minor procedural change, but it massively shakes up the lives of asylum seekers awaiting their interviews. Under this new policy, asylum offices across the country will schedule asylum interviews in the reverse order in which the applications were received. Moving forward, individuals who submit an asylum application will have their interviews scheduled within 21 days. The asylum seekers who filed their applications before the new policy came into effect will be scheduled for their interviews in reverse chronological order. The most devastating consequence of this new policy is that the several thousand asylum seekers who have already been backlogged for two to four years, and were expecting an interview soon, now have their applications delayed indefinitely. This proposed justification reinforces the dangerous and inaccurate idea peddled by the Trump administration that asylum seekers come to the U.S. not to seek protection from human rights violations, but to seek economic opportunities. We at RIF Asylum Support know that this is not the case. 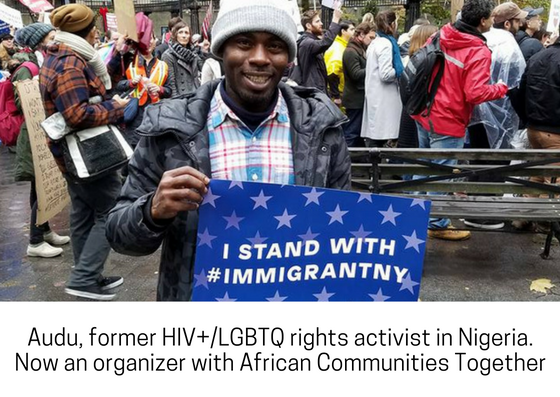 Most of our clients were professionals or activists in their home countries, and their lives were threatened because of their political views, social activism, or sexual orientation. A great deal of these individuals actually had better economic status in the countries they were forced to leave. Whether it was Fatima, involved in fighting gender violence and religious extremism in her native Pakistan, Pap, a journalist imprisoned by his government in West Africa for denouncing corruption, or Julian, a prominent LGBTQ activist in Malaysia, these individuals had no other choice but to flee. Many of the asylum seekers RIF serves were physicians, journalists, nonprofit executives, or university professors in their home countries, where they led upper or middle class lifestyles. Several of our clients traveled abroad to attend human rights conferences and workshops, including being invited by the U.S. State Department to present their work. Unlike in Canada or European countries, asylum seekers in the U.S. do not receive any government support until they are granted asylum. The only “benefit” they receive is a work permit — which reduces the risk of them becoming a “burden” by granting the authorization to work lawfully, obtain a Social Security number, and pay taxes. With a work permit, an asylum seeker is generally able to secure a survival job, such as a dishwasher or home cleaner. They work long hours for minimum wage in order to rent or share a room — or if they are lucky, to send some money home to their loved ones. Since asylum seekers can only petition for their spouses and children to join them in safety after they are granted asylum, the backlogged interview process already keeps families separated for years. During these long waits, it is common for the family members back home to be forced into hiding as a method of survival. Why would anyone choose such a grim life unless they had no other option? RIF supports efforts to reduce the asylum backlog, but such efforts should include prioritizing the cases of those asylum seekers who have been waiting the longest. This week’s dramatic change to the interview scheduling policy does not include any mechanism to ensure that those who have already been waiting several years to have their claims heard will be scheduled for an interview in any reasonable amount of time. In fact, the policy keeps them at the very end of the queue. When asylum seekers came to New York to seek protection, they were caught in the huge backlog in the asylum system. Many of our clients have now been waiting over three years for an asylum interview. To punish those who have already suffered persecution, years of separation from their loved ones, and an indefinite period of uncertainty about their futures, is unnecessarily cruel. No, Mr. Trump, asylum seekers are not frauds with bogus claims. They are here because they thought the U.S. would live up to its commitment to human rights and offer protection to those who need it most.